Chameleon's setup is simple to navigate and seems to keep newer players in mind. While there are multiple openeing credits screens to get through, most of them are skipable by tapping. "Wireless Match Mode" is right on the main menu and download time is pretty quick (between 30 and 40 seconds). Menus are all touch-based. Input is taken with the right amount of sensitivity. The options have a big enough buffer space between them to prevent accidental mis-taps and the labels are large enough to read. The control scheme for Chameleon is pretty much as expected: tapping and touch-control are the primary methods of interaction. In all truth there is nothing wrong with the control scheme itself. It behaves exactly as it was programmed to. I have no complaints about it. It could, however, have been improved (see "smoothed out") through a few creative decisions. One change could have been to anchor the color bar to the bottom of the lower screen. Especially when players are playing with a per-move time limit, removing a button, preventing the need to prevent that button, and having nothing covered up on the board would be a huge help. Another help would have been the option to tap on a neutral spot on the board that borders your territory to change to that color. Again, there's nothing wrong with the control scheme that's there (hence the high score), but it could have been a little better. Sound in Chameleon is almost unnecesary. It plays no direct role in the game except to let you know when time is running out. Graphics are a little simplistic (characters aside), but they don't need to be complex or detailed. The important thing is the colors (not a game for people that are color blind, by the way). The game does have a really nice option selection. Making available almost everything from the single player experience, there are sixty (60) possible rule combinations to create different experiences and includes all three (3) basic versions of the game: Normal, King, and Goal. Many game genres (including Platformers and Role-Playing Games) have limited replayability. A good Puzzle game, however, can be new every time, especially when there is a random board generator to make sure each playthrough is different from the last, and Chameleon has just that. The strategy puzzle's setups are simple to learn but difficult to master - the key to the long-term enjoyment of a game. The player is also given extensive control over basics like time limits in the downloaded games (sometimes more so than in the traditional single-player experience. The game does have it's limits, but most of its problems (see the list of "Next Game Requests" below) are based on missed opportunities, not problems with what's there. It may be simple - and it may be cheap - but it's deffinitely worth at least one look. Anchor the color bar to the bottom of the lower screen. Allow color changing by tapping on neutral areas on the board that border a player's territory. Add more in-space power-ups (both revealed and hidden) and allow for each one to be individually turned on or off by the host. Let players design their own board shape and obstacle layout (not color location/still random). Include pictochat or text messaging for smack talk when there is no Time Per Move limit selected. Create a distraction system that allows users to create sounds and on-screen flashes to distract the other player(s) and allow it to be turned on and off. Offer a Single-Card Downloadable demo of the game to be available (possibly with a tutorial?). 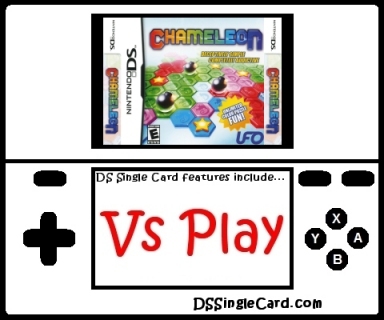 Click here to return to the DSSingleCard.com Chameleon profile.